Today I started my day early and had very small breakfast, by the time I had a chance to have lunch it was about 2:30 pm so I was starving. I ordered a lot of dishes including a whole deep fried chicken. Of course I could finish only ¼ of all portions in front of me. That reminded me of a story I learned from my primary school. The story, as told in various forms throughout the years, is Buddhist folklore about a son who disrespects his mother because of his hunger, ending up with him accidentally killing her in his anger and thoughtlessness. Thankfully, I didn’t harm anyone myself. Here is one short version. Once upon a time, a few hundred years ago at Tad Tong village in the rainy season. Every family was out ploughing the field and preparing it for rice farming. One of the village families has a 30 year-old man named Tong, who was fatherless, and he lived with his 70 years-old mother named Tongsa. One day he went farming early in the morning until late, he felt more exhausted than usual and starving for food. Usually his mother brought him a lunch box every day, but today she was late. He stopped ploughing the field and rest under the shade of a tree, let his buffalo find some grass to eat, and looking to the direction of his home waiting for his mom to deliver the food . He was upset and very hungry. Then he saw his mother carrying a box of food, walking lamely from a far distance. He immediately got up and walked towards her accusing her for being late. Feeling hungry, tired, angry, having a ringing in his ears and feeling dizzy, Tong didn’t want to listen to any excuses. He was furious and grabbed the yoke and hit his mother so hard that she fell down, and he walked away to eat his rice. After he was full, he realized that what his mother said was true. There was plenty rice left over in the box. He felt guilty so he rushed to see his mom. He saw his mother lying still and he rushed to her at once. The poor old woman had hit her head on the ground when she had fallen down and she was dead. Having realized how violently he had treated his mother, he hugged her dead body and cried his heart out. But his mother could in no way come back to life. 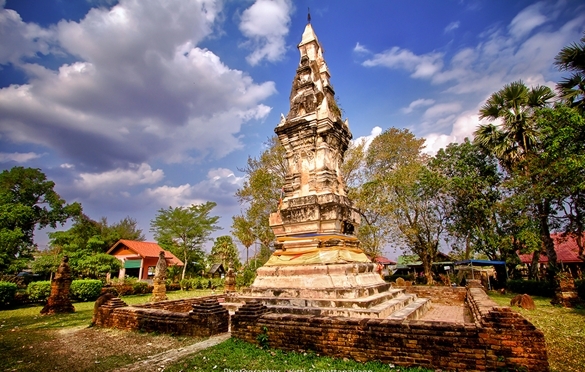 Tong built a stupa there to dedicate merit to his mother and to keep her bones. The stupa was shaped like that box of rice . People, therefore, called it “The stupa of a small Box of Rice.” It is situated in Yasothorn province in Northeastern Thailand. This story is well known among Thai people. There are also songs and movies that are based on this story. A young Thai composer born in Northern Thailand named Thanapoom Sirichang (ธณภูมิ ศิริช่าง) has turned the traditional Buddhist story into a one-act chamber opera which had its debut on March 2009 in Tasmania. This production is entitled The Lunch Box. A folk tale opera in Thai language is rather unique, and likely not to be widely known, but interesting how this story has made its way from oral folk tradition to a contemporary stage production. One scene of the opera is shown in the video clip below. The English subtitles shown above the actors are not additions on the video; these are projected above the stage in real time for the live audience at the opera. Can you type the original dialogue in the video? It is so very difficult to read Thai because it looks like scribble when the fonts/letters are so tiney. I wonder all the time, is the cirkel within the letter up (doo dek) or down (koo khwuai). I only see it well when I copy text into ms word and make them really big. That is also for correct understanding the signs above and below the letter. By the way, I already use reading glasses. 555! keep up the good work, Mod!